After presiding over a chaotic Democratic presidential primary on April 19, the New York City Board of Elections released its certified election results on May 6 showing that it had rejected 91,000 provisional affidavit ballots, or about three out of every four cast on election day. Diana Finch, who has served as a poll worker for nearly a decade, said the number of affidavit ballots in her Bronx election district far exceeded the usual number. There were a total of 121,056 affidavit ballots submitted, according to the Board of Elections. Finch explained that the 90,998 ballots excluded from the final tally have not been discarded, but have been set aside for possible further review. The burden of proof, however, has now shifted from the Board of Elections to voters. According to Jonathan Clarke, a lawyer with voter advocacy group Election Justice USA, the voters behind those 91,000 affidavits must request the status of their ballot in person at the BOE’s office and contest it in court if they feel it was wrongly set aside. People whose votes were excluded must act quickly to contest their affidavit status by the May 25 deadline, given the BOE’s recent certification. At the BOE’s two public hearings following the primary, hundreds of voters catalogued instances of alleged disenfranchisement — including polling places that didn’t open on time, a lack of interpreters and, most prominent, widespread confusion about affidavit ballots. Affidavit ballots are reserved for voters whose names don’t appear on the voter rolls, but an unusually high number of affidavit ballots were cast, giving fuel to claims that voters were wrongly removed from the rolls. At a raucous public hearing May 3, Angelica Thornhill, 30, of Crown Heights, told the board that she painstakingly took steps to ensure she was a registered Democrat, yet when she showed up to vote the rolls showed her registration as unaffiliated. “If that’s your mistake, my vote should be counted,” she pleaded with the commissioners. But the board claims that most of the voters who believe themselves disenfranchised are actually just confused about the primary laws. “More often than not, you’re finding invalid affidavits in primaries because people are trying to vote parties that they’re not registered,” BOE Executive Director Michael Ryan told reporters. Under New York State’s closed primary laws, only registered Democrats and Republicans can vote in party primaries. It is unclear how many of the 121,056 affidavit voters were wrongly removed from the rolls—but the BOE has suspended two senior officials without pay pending investigation into their roles in an improper purge of 126,000 Brooklyn Democrats from the voter rolls. Both State Attorney General Eric Schneiderman and New York City Comptroller Scott Stringer have launched separate investigations into the BOE’s actions. As for the contingent of concerned voters that lodged complaints to the board over the past two weeks, Ryan rejected their concerns, saying they were part of an organized group with a specific agenda. Manhattan resident and voting rights activist Nisi Jacobs disagreed. Whether the BOE will be forced to make any significant reform remains to be seen, as the board has a long history of obfuscating votes. Although the board’s handling of the April primary is currently receiving a lot of attention, Massol noted that the extra scrutiny is driven by the ability of white progressives to garner media attention for the abuses they experienced. “This is a bigger problem than just the Sanders campaign getting disenfranchised,” Massol added. The same insular political culture that nurtures the BOE produced the laws that exclude non-party-affiliated voters from participating in primaries. So says Megan Ahearn, program director at the nonpartisan government watchdog New York Public Interest Research Group (NYPIRG). 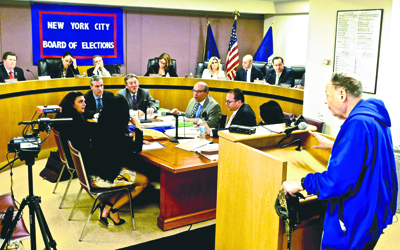 The six-month deadline New Yorkers have to change parties before a primary “was brought about because the BOE system is run by the parties,” Ahearn told The Indypendent. “The state is not going to fix itself,” Massol said. Instead, it will take a concerted effort from independent good-government groups and outraged citizens to create the momentum for change. Some at the BOE’s public hearings have called for a recount, others for the U.S. attorney general to intervene. In April Mayor Bill De Blasio offered the BOE nearly $20 million in exchange for “commonsense” reforms. There is no shortage of ideas, but Massol warns that advocates for reform also “need to be realistic, not make promises or say things we can’t deliver on.” The veteran of good-government efforts continued, “There’s not going to be a recount” in a contest that Clinton won by 58-42 percent with a statewide margin of 290,000 votes. Separate investigations launched by State Attorney General Eric Schneiderman and City Comptroller Scott Stringer may provide some insight into the BOE’s missteps, but political calculations may water down any findings—Schneiderman’s eye is on a future run for governor and Stringer is widely thought to be weighing a 2017 mayoral bid. 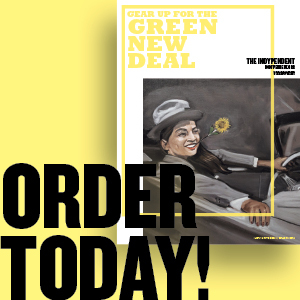 But it is common knowledge that a majority of legislation fed to state Democrats by voter advocacy groups runs the high risk of becoming a so-called “one-house” bill—one that passes the Democrat-dominated State Assembly only to die in the Republican-controlled Senate with the behind-the-scenes blessing of Gov. Andrew Cuomo. “The powers that be don’t want this change,” Massol said.